I’m not a good judge, but I did tune in. I wanted to see Scherzer pitch, I had missed the first inning, and the first thing I saw was giving up a home run to Ashley Judd. Oh well. I flipped back to Tour de France, with the commentators trying to make some excitement out of what we were seeing. I stayed with that for a while, not so much because of all the competitive drama they were selling but because of the scenery. French Alps, wow! Also I wanted to watch those guys scream downhill at 50 or 60 miles an hour when anything over 30 gets me pretty scared! I turned back to the All Star game in time to see Bryce Harper strike out. Back to watch a very excited French rider win the stage. I agree with Todd, the game should mean something. The teams are like the sandlot teams we used to have in high school where every one assembled and the captains (the best players to make sure they weren’t on the same team) chose his players and the game started. Shirts vs Skins. Nine guys playing the same game on the same field at the same time but nada said about being a team, or having a reason to win, or being managed or taking any kind of a risk (e.g. sliding into home) for no reason. Don’t expect too much and you won’t be disappointed. This is not a replay of the Gunfight at the OK Corral or Pickett’s Charge. PS: If you look at the ESPN article mentioned above there are some great video highlights from past All-Star games. The worst part about the game not meaning anything from the TV-viewing perspective is that it gives Fox the license to deploy all these intrusive gimmicks with microphones, including on players in the field every inning. I am not interested in the announcers’ inane hear-themselves-talk chit-chat. And if you mute the TV, half the camera coverage is still a close-up on some fielder apparently mostly talking to himself and half-watching the game. I’d recorded the broadcast and started watching from the recording around 8:45 so that I could fast-forward thru the commercials and gratuitous patriotic zeal; my recording buffer and patience and endurance ended exactly on Segura’s HR, and I said: perfect timing; delete. And went to bed. Richard, I was at the game in 117 dugout box, 7th Row, and every pitch was exciting. It’s all in the eye of the beholder. If you have a true passion for the sport, the All-Star Game is heaven. One of my highlights occurred when Snell was on the mound, and he fell behind Freddie Freeman 2-0. I razzed him with my stentorian voice heard up and down the AL dugout, “He’s afraid of you, Freddie! He can’t throw a strike! He’s afraid to throw the ball over the plate!” The entire AL bench turned around and looked at me with astonishment. AJ Hinch turned around and smiled. Several players smiled and chuckled. The fans around me burst into laughter. It was a true baseball moment. I only wish I’d captured it on video. Another highlight was entering the Home Plate gate on the First Base side and sauntering towards 127 to look for a friend. I spotted some fans wearing Nationals jerseys for the National League team and remarked how attractive they looked. It turned out they were guests of Josh Hader — his girlfriend, her mother and her brother, from Houston. I immediately told them how much I loved watching Josh pitch because he played for Old Mill in Millersville, MD, and my son had attended Meade High, an Arundel League competitor, at the same time. I told them my son played JV Baseball in the spring of his sophomore year 2011, but he quit to devote all of his time and energy on Meade’s Varsity Soccer team the next year, so he never faced Josh on the diamond. At the time he quit, I told him that he’d regret it, but I’d support his decision. As I walked away from Josh Hader’s guests, I thought to myself what would my son’s life be like now if he had faced Josh and been successful with the bat against him? It was one of those moments we all have about reflecting on the decisions we make in life. Baseball teaches us many things, and like all sports, it teaches us how to win and lose. It teaches us success and failure. It gives us so much more of course. PS My son was captain of the Delaware County Community College soccer team two years ago, and he is now studying biology at Temple. We still enjoy going to baseball games together. I think the earlier commentator who said that player and fan interaction would help the game was spot on. I saw the game on TV and thought there was a fair amount of action and suspense, especially with the game going into extra innings. I was struck by Tom Boswell‘s article today about the All-Star game he saw in 1969 and how much those memories have remained with him over the last 50 years. When Rick invited me to the All Star game, I said something like “I can’t pass up this opportunity to see Mike Trout. I won’t have another opportunity to do so.” Seeing Mike Trout hit a home run off a low an outside ball into the left field stands will remain my highlight. If I were alive 50 years ago and if Mike Trout become part of the “best of all-time discussion,” I would be the one saying I saw Mike Trout pull a home run off DeGrom. Just like my saying that I was at the game and saw Mickey Mantle hit the 565 foot homer over the left field bleachers at Griffith stadium. At the same time, I groaned a bit when the NL tied the game in the ninth inning and forced the game into extra innings. Rick, Ellen, and I said that we’d watch one more inning, but we wouldn’t have been disappointed if they’d called the game a tie after nine. The all-star game is an exhibition again the way it should be. I never liked the WS home-field advantage hook. Let the players mingle, let them have some fun. 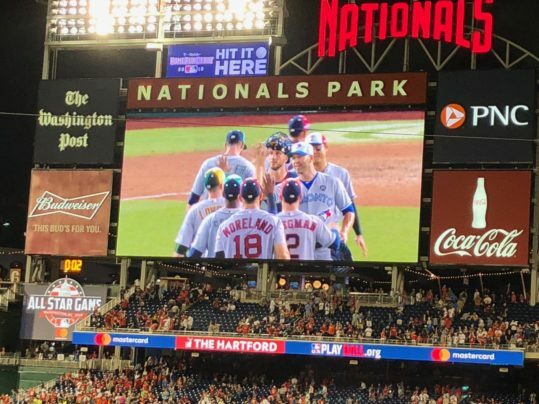 I watched the first few innings from home and even enjoyed the players talking into the mike – but agree that the cameras spent too much time showing the player rather than what was going on in the game. Harper saying “that one’s gone” was priceless. Watching Scherzer was terrific. Harper, not so much. Over the last year or so he just tries too hard and whiffs. Seems like too many HRs in the rest of the game – make me wonder if the pitchers were grooving the ball a bit.